Reference: Seth Shulman et. al., 'Smoke, Mirrors & Hot Air: How ExxonMobil Uses Big Tobacco’s Tactics to Manufacture Uncertainty on Climate Science'. Union of Concerned Scientists, January 2007, pp. 4-5. ExxonMobil (trading as Esso in some countries) is the largest publicly traded company in the world with revenues of hundreds of billions of dollars, more than the gross national product of most nations. Its greenhouse gas emissions, including those from the use of its products, also exceeded that of most nations of the world. Its profits in 2005 were $36 billion. Reference: 'Toxic 100 Air Polluters', Political Economy Research Institute, March 2010; Richard Heede, ‘Tracing anthropogenic carbon dioxide and methane emissions to fossil fuel and cement producers, 1854–2010’, Cllimatic Change, Volume 122, Issue 1-2, January 2014, p. 237. In 2010 it was the 2nd worst top toxic air polluter in the US and had emitted the second highest amount of greenhouse gases historically of any organisation in the world. Source: 'Inside Exxon’s Great Climate Cover-Up', Democracy Now!, 24 September2015. Reference: Bob Ward, The Royal Society, letter to Nick Thomas, Esso UK, 4 September 2006. While assessments such as those of the IPCC have expressed growing confidence that recent warming can be attributed to increases in greenhouse gases, these conclusions rely on expert judgment rather than objective, reproducible statistical methods. Taken together, gaps in the scientific basis for theoretical climate models and the interplay of significant natural variability make it very difficult to determine objectively the extent to which recent climate changes might be the result of human actions. The "expert judgment" of the Intergovernmental Panel on Climate Change was actually based on objective and quantitative analyses and methods, including advanced statistical appraisals, which carefully accounted for the interplay of natural variability, and which have been independently reproduced. Furthermore, these statements in your documents are not consistent with the scientific literature that has been published on this issue. Reference: Kenneth P. Cohen, Exxon Mobil, letter to Lord Rees, The Royal Society, 25 September 2006. ExxonMobil responded to The Royal Society by pointing to public documents in which it accepts that global warming is real. It also pointed to its funding of efforts to find technologies to reduce greenhouse gas emissions. ExxonMobil, however, continues to oppose regulatory measures to deal with greenhouse gas emissions. Reference: ‘Energy and Carbon -- Managing the Risks ’, ExxonMobil, accessed April 2014, p. 7. Reference: ‘Energy and Carbon -- Managing the Risks ’, ExxonMobil, accessed April 2014, p. 1.
we are confident that none of our hydrocarbon reserves are now or will become "stranded." We believe producing these assets is essential to meeting growing energy demand worldwide, and in preventing consumers – especially those in the least developed and most vulnerable economies – from themselves becoming stranded in the global pursuit of higher living standards and greater economic opportunity. The Royal Society noted in its letter that in 2005 ExxonMobil "provided more than $2.9 million to organisations in the United States which misinformed the public about climate change through their websites. Reference: Seth Shulman et. al., 'Smoke, Mirrors & Hot Air: How ExxonMobil Uses Big Tobacco’s Tactics to Manufacture Uncertainty on Climate Science'. Union of Concerned Scientists, January 2007, p. 5. In 2007 the Union of Concerned Scientists (UCS) reported that Exxon Mobil had given around $16 million to some 43 advocacy organisations between 1998 and 2005 "to deceive the public about the reality of global warming" and cast doubt on the idea. Reference: Seth Shulman et. al., 'Smoke, Mirrors & Hot Air: How ExxonMobil Uses Big Tobacco’s Tactics to Manufacture Uncertainty on Climate Science'. Union of Concerned Scientists, January 2007, pp. 10, 31-3. Reference: ‘Koch Industries: Secretly Funding the Climate Denial Machine’. Washington, DC: Greenpeace USA, March 2010, p. 19 ; David Adam, 'ExxonMobil continuing to fund climate sceptic groups, records show', The Guardian, 1 July 2009. 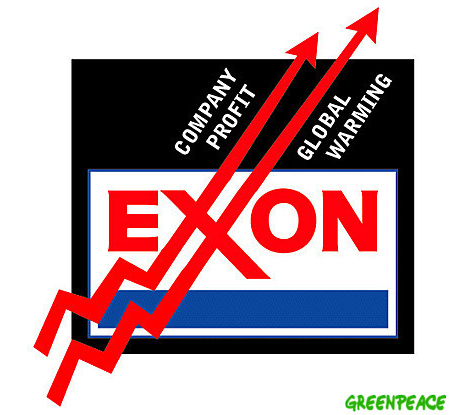 Between 2005 and 2008 ExxonMobil spent a further $8.9 million on funding such groups. The Guardian newspaper reported in July 2009 that Exxon was still funding groups promoting global warming denial even though it had said it would stop after exposure by The Royal Society and UCS. It spent hundreds of thousands of dollars on this in 2008. 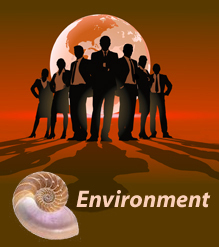 For example, $75,000 went to the National Center for Policy Analysis (NCPA) in Dallas, Texas, whose "scholars believe that while the causes and consequences of the earth's current warming trend is [sic] still unknown, the cost of actions to substantially reduce CO2 emissions would be quite high and result in economic decline, accelerated environmental destruction, and do little or nothing to prevent global warming regardless of its cause". Reference: Seth Shulman et. al., 'Smoke, Mirrors & Hot Air: How ExxonMobil Uses Big Tobacco’s Tactics to Manufacture Uncertainty on Climate Science'. Union of Concerned Scientists, January 2007, p. 11. The UCS points out that by funding so many groups with shared staff and advisors (see diagram), Exxon is able to "provide the appearance of a broad platform for a tight-knit group of vocal climate science contrarians. The seeming diversity of organizations creates an "echo chamber" that amplifies and sustains scientific disinformation". Exxon Mobil's political action committee and individuals associated with ExxonMobil had made over $4 million in political contributions between 2000 and 2006. Reference: Seth Shulman et. al., 'Smoke, Mirrors & Hot Air: How ExxonMobil Uses Big Tobacco’s Tactics to Manufacture Uncertainty on Climate Science'. Union of Concerned Scientists, January 2007, p. 5. ; 'A Climate of Corporate Control How Corporations Have Influenced the U.S. Dialogue on Climate Science and Policy', Union of Concerned Scientists, May 2012, p. 17. ExxonMobil spent $61 million on lobbying between 1998 and 2005 and $131 million between 2002 and 2010. Reference: 'A Climate of Corporate Control How Corporations Have Influenced the U.S. Dialogue on Climate Science and Policy', Union of Concerned Scientists, May 2012, p. 17. Lobbying expenditures increased particularly between 2007 and 2009 when climate change bills were being debated in Congress. Reference: Seth Shulman et. al., 'Smoke, Mirrors & Hot Air: How ExxonMobil Uses Big Tobacco’s Tactics to Manufacture Uncertainty on Climate Science'. Union of Concerned Scientists, January 2007, pp. 19-20. "successfully urged the Bush administration to renege on the commitments to the Kyoto Protocol made by previous administrations"
"successfully lobbied the Bush administration to try and oust the chair of the IPCC"
was able to have its recommended candidate appointed as chief climate negotiator for the US. Reference: 'ExxonMobil LNG ad claims shot down in ‘green’ flames', Marketing, 4 September 2009. 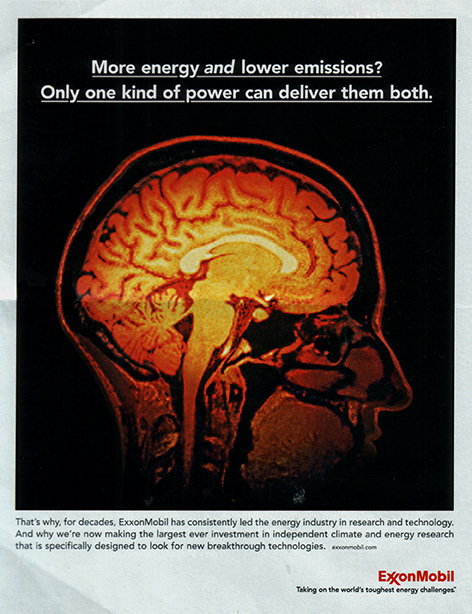 The following ExxonMobil advertisement was banned by the UK Advertising Standards Authority (ASA) because of its misleading claim that Liquified Natural Gas (LNG) is "one of the world’s cleanest fuels". Source: 'ExxonMobil's misleading ad? ', 3 September 2008. Source: 'Exxon Mobil TV Commercial Spoof', Solar Dave, 25 March 2009.